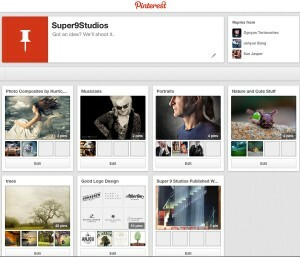 Why Use Pinterest to Build Your Brand? 70 percent of people say they go to Pinterest for inspiration and recommendations (compared to 17% on Facebook). Irene and I just gleaned some powerful information from Melanie Duncan‘s Creative Live course Unlock the Power of Pinterest, and we want to share some ideas to get the Pinterest juices flowing. Businesses should create a business account by going to business.Pinterest.com, or you can convert your existing personal account. This is so that you can attach the name and url of your business to each pin. Follow other Pinterest users that share your audience. Yes! That means your competitors. Look for people and pages that you know your ideal customers are probably following. The people you follow should have at least 1,000 followers. Post Pinterest links as updates on your Facebook page. Promote specific boards on your Facebook page. Create a contributor board by inviting customers, colleagues, and competitors to contribute to your boards. The benefit is that now you have access to all their followers! Book a free Coffee Consult with the Hurricanes today to find out more.